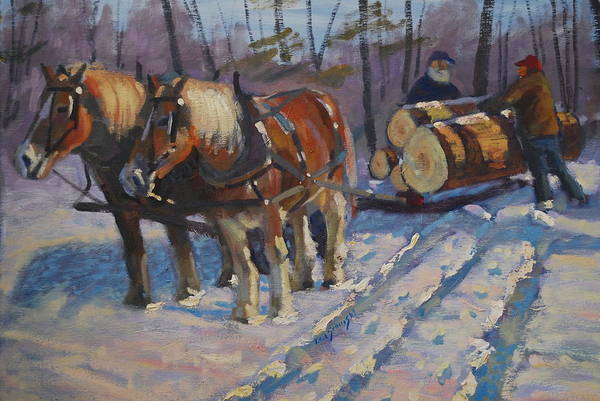 Winter Logging by Len Stomski - 8.000" x 5.375"
Winter Logging art print by Len Stomski. Our prints are produced on acid-free papers using archival inks to guarantee that they last a lifetime without fading or loss of color. All art prints include a 1" white border around the image to allow for future framing and matting, if desired. Thank you Cathy, Very much appreciated. Love this painting, Len. It brings back memories of my life in upstate NY. Beautifully done. Thank you Barbara, Very much appreciated. Thank you Maya, Very much appreciated. Thank you Todd, Very much appreciated. One of my most favorite of all paintings you have. 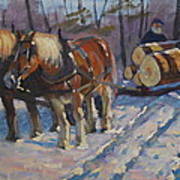 As I come from a family of loggers and also am Vice President of a logging company in Michigan in which my mom owns. I will have to tell my mother to check out you painting she just may be interested in a purchase. Your talent is extraordinary and I admire your work very much! Love your gorgeous painting, Les! You really captured the feeling and the moment so well! Thanks for your comment on my "My 1st left hand painting - Guatemala Impression V "! 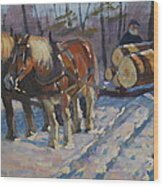 This masterful and beautiful painting brings back memories of my family going after logs in the Snowy Range when I was about 5. 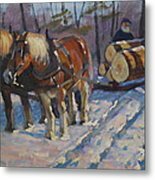 After a very scary, slippery drive up a primitive "road" up and up the steep, rugged mountain, we finally came to a clearing where a team of Belgians just like this one stood patiently waiting with the load of pine logs. This is just perfect in every way! Love it! I love your colours. Beautiful work. painted around 2003 from photos taken of the Harwood brothers.